Time for another comfort food makeover! Many of you already have enjoyed my cashew-based vegan “cheese” sauce, but today I wanted to attempt a nut-free vegan, cheese sauce–> one that would be properly combined when enjoyed with a high-quality pasta! The star of the show? You could probably use any type of potato for this recipe, but I like the extra nutritional bang from using the sweet variety. A creamy, dairy-free "cheese" sauce that's perfect over noodles or veggies! In a small sauce pan, steam the sweet potato chunks until tender, about 10 minutes. Mash the cooked potato with a fork, then measure out one cup of mashed sweet potato for the sauce. Add the one cup of mashed sweet potato to your blender, along with the rest of your sauce ingredients, then blend on high, until smooth and creamy! Adjust the seasonings to taste, then serve over a bowl of your favorite piping-hot pasta! If you don’t use up all of the “cheese sauce” in one dish, you can save the leftovers in the fridge for up to 4 days. I plan on enjoying my leftover sauce over some steamed veggies for dinner tonight! I feel bad having to write a not so great review, after reading all the amazing ones. I did substitute unsweetened hemp milk, rather than almond. I’m not sure if this was what set the dish off, but it was not good. My partner and I were so excited to try this, but it was not tolerable for either one of us. I have a gluten allergy, so maybe it was the GF pasta that I used?? It’s difficult for me to know where I went wrong with this dish, but it was not salvageable. I have tried other recipes from your site that are amazing, by the way. Any insight is graciously accepted. Thanks so much! Did you like the flavor of the ingredients you used? The first thing I would do is taste each ingredient individually (like the hemp milk and GF pasta) to make sure you like their flavor before using them. Also, make sure you used nutritional yeast, and not brewer’s yeast, as that would make it totally inedible. Hope you have better luck next time! Thanks for your response, Megan! I am fairly certain it was the hemp milk. Ironically,the unsweetened Tempt Hemp milk has vanilla in it. The vanilla is too overpowering, I believe. It works with baking, but not so much with recipes like this. Also, just to confirm, I did use nutritional yeast. I may try it again, with the milk you recommend in the recipe. Thanks again, and have a blessed day! HEY I Just made this with butternut squash instead, turned amazing! My kids love the cashew Mac and cheese, now let’s see if it’s a pass with this one..
sweet potatoes come in such varied sizes. can you tell me how much sweet potato by weight? I just made this tonight but I didn’t have a white sweet potato so I used butternut squash puree instead! The kids loved it! Yay! Thank you for doing a nut free version! This looks great! I tend to stock up on canned coconut milk; do you think that’d work instead of the almond milk? What about a cup of canned sweet potato? omg this is the best mac n cheese ever. my kids don’t like it but i am gonna eat the whole thing, i can’t stop. I’m going to make this tonight! How much pasta should I use? We usually use an 8oz. box, but sometimes there’s leftover sauce. It will depend on how “saucy” you like your noodles! I made this first as instructed but found that it had an odd taste and after taste. I realized it was the almond milk so I eliminated the almond milk, increased the lemon juice (small whole lemon) and salt, added chopped half onion and three minced cloves of garlic (instead of onion powder) and a teaspoon of yellow mustard. For some heat, I added a lot of cayenne pepper and black pepper. I combined all ingredients over low heat then mixed it with spaghetti squash, roasted cauliflower and sauteed mushrooms in a rectangle casserole dish. Sprinkled more nutritional yeast on top. Baked at 400 degrees for 20 minutes. AMAZING!! Thank you for this recipe. I could never have made my own version had it not been for your recipe. Again thank you for sharing. This was SO GOOD! I’m never making regular mac ‘n’ cheese again! I don’t eat vegan, so I didn’t use the nutritional yeast. Instead, I used some organic Wisconsin sharp cheddar (from Whole Foods). I also forgot to put the lemon juice in, and I did add a bit more salt. This was such a great gluten-free and HEALTHY alternative to the regular American staple food. I have tried the nutritional yeast many times. And I get feeling so sick after I have some. I did try your “Mac & Cheese” and I had an upset stomach for a few hrs. after. I can eat the other things in the mix but I think the yeast is the one that is making me feel sick. Any ideas as to what I can use instead? I want to eat this healthier way, I just can do the nutritional yeast. This is SO delicious!!! I made a double batch half regular potato and half sweet potato. This looks great! Do you have any suggestions on the best kind of nutritional yeast, or the cheesiest tasting? I was at a restaurant recently and we were served the most delicious nutritional yeast ever – so much better than anything my parents or I have found. Thanks!! Made this for dinner tonight! It’s so yummy!! And very quick and easy to make. I used homemade rice milk and an orange sweet potato… gave it a nice “cheese” color that could fool anyone. I put it over a mix of pasta (spiral shape catches the sauce nicely) and steamed veggies (broccolini, asparagus, and pattypan squash). Yum! WOW! Can I just say, WOW?!! I have TRIED and TRIED to find a mac and cheese recipe I like (sans cheese), and I have never had success! THIS WAS AWESOME. Seriously–all picky kids and adults liked it! It will be a regular!! Thank you!! Yay! I’m glad you guys liked it! OMG! This is so perfect! I made it with an orange sweet potato (yam) and it looks just like regular mac & cheese. Thank you so much for making a cheese sauce without nuts! This was so delicious! 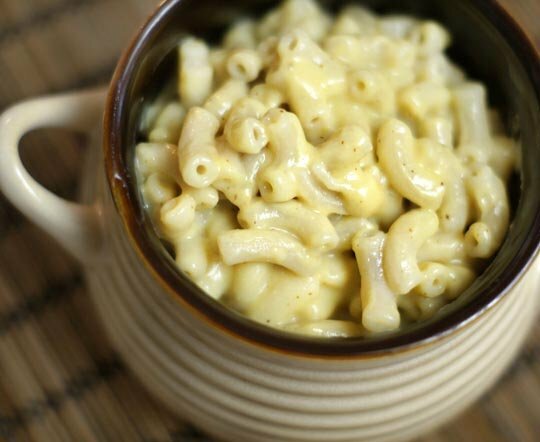 I was looking for an easy vegan mac/cheese recipe, and fell in love with this wholefoody and easy recipe. I used regular orange sweet potato, 1/5 small onion instead of powder, cayenne for the chili and forgot the lemon, but I loved it anyways. Thank you! I am obsessed with your Vegan Mac and Cheese recipe. I make it like every week. I am going to have to try this! What milk would you suggest in place of almond milk to make it completely nut free? Any type of milk that you have on hand would work– rice, hemp, etc. I was going to ask the same thing. 🙂 I make my own rice milk (so much cheaper than store-bought and easier than almond milk – no straining!) on a regular basis. 1 c cooked rice + 4 c filtered water + 1 tbsp sweetener + 1 pinch salt -> 4 minutes in a blender (2 minutes if you have a high speed blender like a vitamix)… and you have rice milk! I will have to try this one soon! Is nutritional yeast bad to have with a candida cleanse? No, nutritional yeast is inactive and is usually considered safe for candida cleansing! Thanks for a nut-free mac ‘n’ cheese sauce! My grandson is deathly allergic to nuts and this would be one I could serve to him. Question: are the white sweet potatoes as rich in beta-carotene as the orange ones? I believe the orange sweet potatoes do have more beta-carotene than the white-fleshed variety. Well, I made it without the nutritional yeast and it was delicious! Everyone in my family devoured it. Thank you for sharing a great recipe!! Next time I’ll try it with the yeast to see how that is. Thanks!! This looks SO good! Do you think I could make it without the nutritional yeast?? I don’t have any on hand right now, but have all the other ingredients. Love your site and all your recipes! Thank you! Ok I made this and it was sooooo easy and amazingly delicious!!!! a 4 year old, a 7 seven year old and a 14 year old that thinks he knows everything and that cannot be fooled, absolutely loved it!!!!!! This and many of your recipes are becoming regulars in my house. The best part is that seriously my kids love almost all of them too. thank you!!!! YOU ARE AWESOME!!!!!! 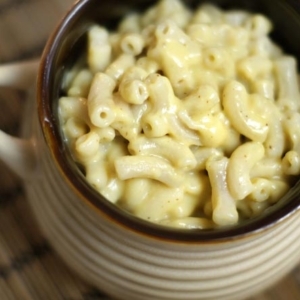 This turned out great, between this and your other Mac and Cheese Recipe my kids don’t want to eat anything else! Yay! So glad your kids enjoyed it!! This was awesome! I used a left over baked sweet potato. A little sweeter but the color was perfect for real cheese. The kids loved it. Thanks! Megan, This is totally genius! I am absolutely going to try this. I bet it would be delicious with zucchini pasta as well! I’m also a huge fan of white sweet potatoes. I started eating them last fall and sometimes I actually enjoy them much more than orange sweets/yams. I made this tonight….poured it over roasted spaghetti squash and added sauteed mushrooms and spinach. It was soooo delicious! Thank you! Yum – this sounds delicious! I am so making this soon! Yet another one of your recipes that I’ve starred for later reference! I have some sweet potatoes from our CSA curing right now. I think I will have to give this one a try! Luv the recipe!! Angela at OSG recently posted a similar one using butternut squash..you gals are so creative..luv! Do you think that white sweet potatoes taste much different than the orange sweet potatoes (yams?) ? YUM! 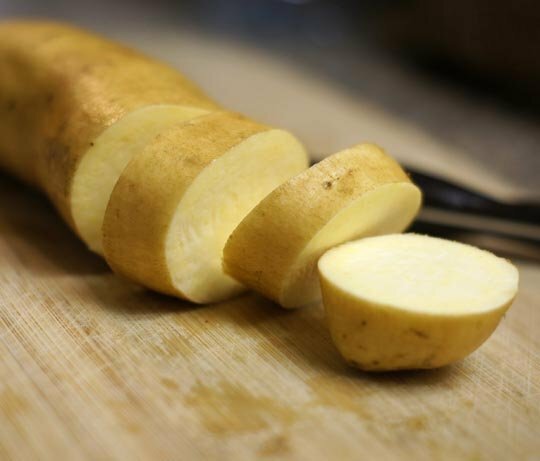 love white sweet potatoes, had them for the first time a few years ago, got them from a local farmer so good!